The Dogie Trail is a step back into the days where Cowboys ruled the land. Dogie is cowboy slang for motherless calf, alluding to the area’s ranching history. Cowboys once herded cattle along this route through Sycamore Canyon. Evidence of this history remains in the form of stock tanks that sit along the path. The trail is covered with crimson-and-cream colored bluffs topped with junipers and pinon pines. Hikers may find pools that linger from recent rains shaded by cottonwood and willow trees. 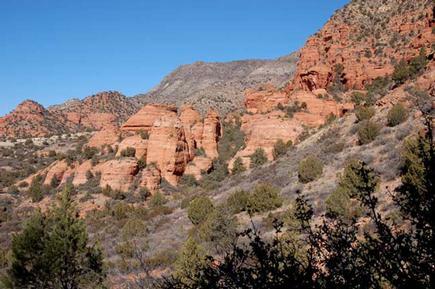 The hike ends at junction with the Sycamore Basin Trail in the Coconino National Forest. The trail is hailed as a rugged beauty that has been unspoiled and untamed by man. Posted on August 4, 2014 by League Staff in The Great AZ Road Trip | Tags: Hikes, outdoors, Prescott Area, Rim Country, summer, trails, Verde Valley | permalink.